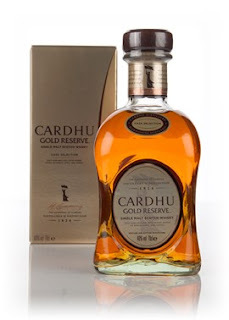 Cardhu..... Well, there's not much to say. It's a Diageo workhorse for blends like Johnnie. Recently though they've needed more for single malts, so changed Dailuiane's cut points to make it more like Cardhu. It's a shame really because in my experience Dailuiane makes a much more characterful spirit. There was also a scandle before my time, when they changed it to a blended malt. Nose: Light and sweet, oaky spiciness, creamy oak and light fruit- Lots of pineapple, some apple and pear, vanilla, brown sugar, perfumed malt. Taste: Vanilla and spice, oaky note with delicate sweetness- Pineapple, maybe some pear, bit of roughness, nuts, light perfumed malt, light citrus- Lemon. Finish: Short length. Drying oaky sweetness with a touch of spice. Reminds me a lot of Singleton of Dufftown, light Speyside malt. Maybe the more expensive NAS will be better? Nose: Quite sour- Sour fruit, green apple sours, sour cherry, sweet artificial vanilla, a little oak and spice, it's all very vague and very Cardhu. Caramel and toffee (E150a? ), some light cake in the background. Taste: Smooth and a little watery. Quite fruity and sweet- Green apple, sour wood, a little sour cherry, dry wood, artificial vanilla. Finish: Short length. Sour oak and fruit. 'Easy drinking' NAS at it's finest. These are often on deal in UK supermarkets but I don't find them to be to my liking.